Apple is expected to sign its first internet radio licensing agreement with a major record label perhaps as soon as next week, multiple sources with knowledge of the talks have told The Verge. Universal Music Group, the largest of the major record companies, has reached the final stages of the negotiations and Warner Music is close behind, the sources said. At the end of March, a similar report from The Verge noted Apple had aggressive plans to launch their said radio service this summer. It was reported earlier by the New York Post Apple had tried to negotiate lower prices to stream songs, at a rate which undercut Pandora at $0.06 per 100 songs, which record labels had rejected. Last week CNET noted sources said Apple still had to sign Sony Music Group on board along with numerous other music publishers. 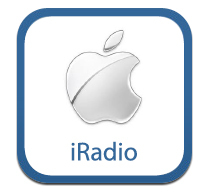 The “iRadio” service was said an attempt to boost iTunes music sales, and localized launches were being planned for up to a dozen different countries. With competitors such as Pandora already off to a head start on streaming radio, it is unknown how Apple’s version would be any different for consumers, aside from probably the price and integration with iOS devices and Mac OS X.